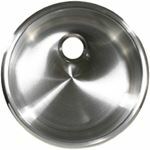 18/10 Stainless steel mirror finish cylindrical sink. Mirror finish basins are not recommended for exterior use due to the reflective nature of the polished stainless steel. These sink drains fit all Scandvik sinks except 10280 & 10662. Fit a 2-7/16" drain hole opening. Includes drain, stopper & chain. 4-1/4" Long, with 1-1/4" female threaded connection & 1-1/4" outlet. 18/10 Stainless steel mirror finish rectangular sinks. Take full advantage of the space in your galley, create your own multibowl sink with two or more rectangular sinks. Mirror Finish basins are not recommended for exterior use due to the reflective nature of the polished stainless steel. 2-1/16" Drain opening, 1/2" flange, Profile A. Fits 2-1/16" drain hole openings. Sink drain with a 1? hose barb connection. Includes stopper and chain. 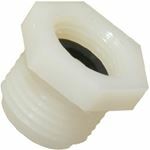 Our most popular easy to install drain. Requires 1-1/4" clearance below sink. Non corrosive plastic sink waste strainer. Round. Mirror finished 304 stainless steel. Edge profile A -above counter. (All flanges can be installed below counter).